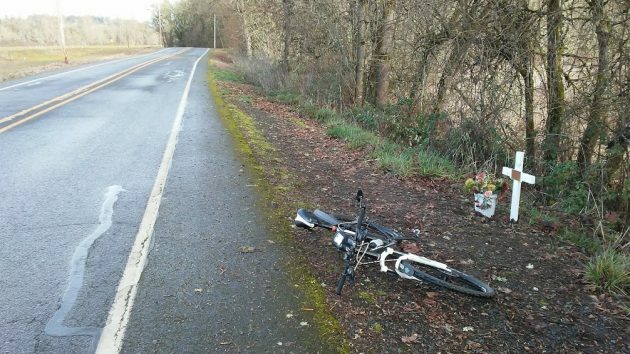 I put down the bike to take a closer look at this roadside memorial on Bryant Way. This is the spot on Bryant Way where, on Oct. 30, 2017, somebody found the body of Albany resident Aurelio Reyes Zamora. The investigation of his death is still open. 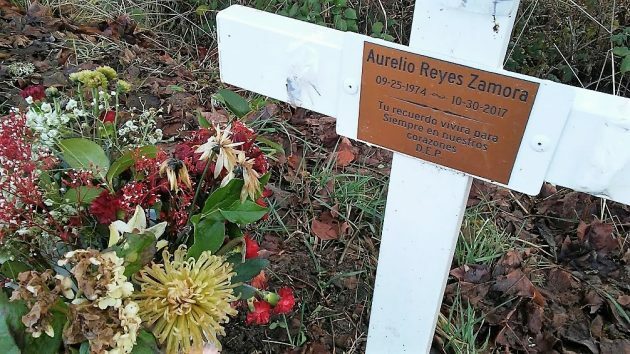 Aurelio Reyes Zamora was 43 when he died. According to a newspaper article after his death, his family had last seen him on Sept. 27, 2017. A month later he was reported missing. The Linn County Sheriff’s Office has been looking into the case. Sheriff’s Detective John Lovik, when I called him today, was not at liberty to tell me much because of the ongoing investigation, but he said it’s being investigated as a possible homicide. Reyes Zamora had been working in farming and doing odd jobs, according to the detective. In June 2009, then listed as a Jefferson resident, he was struck by a car and injured while walking on Queen Avenue in Albany. This has got to be heartbreaking for the family. I don’t recall the story. What was the cause of death? Thank you for bringing this back into focus. The investigator would not tell me the cause of death on the grounds that the investigation remains open and that kind of detail is important in questioning people. Thanks for asking.